Celebrating a half century of design in posters, flyers and advertising ephemera, The Art of British Rock highlights the UK’s distinct contribution to rock’n’roll graphics. From custom designed posters for provincial ballrooms in the late 50s to the computer-generated images of today, rock music illustration has reflected – and influenced – crucial changes in popular visual art. With classic examples (some unseen for many years) of key styles including pop art, psychedelic illustration, punk ‘do-it-yourself’ and digital imaging, the book documents the stunning visual style of British rock from the era of the Beatles and Rolling Stones to the present-day art of indie guitar bands, cutting-edge soloists and contemporary clubland. Arranged chronologically, The Art of British Rock features more than 350 posters ranging from the work of anonymous artists to internationally acclaimed designers including the Hapshash group in the 60s, Hipgnosis and Barney Bubbles in the 70s, and Malcolm Garrett, Peter Saville and Vaughan Oliver in the 80s and beyond. All are the subject of special features within each chapter. 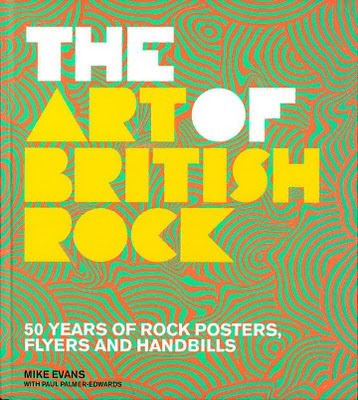 Concluding with the mix of retro and state-of-the-art design that has characterised rock poster illustration in the first decade of the 21st century, this is a unique account of more than 50 years of British rock’n’roll art. This entry was posted in HGD News. Bookmark the permalink.